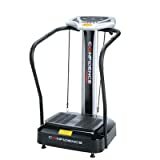 1.1 How do vibration plates work? When you decide to invest in personal gym equipment you’ll find that there are almost too many machines and brands to choose from, and so you may end up feeling a little overwhelmed. You may think that getting fit and losing weight must involve painful treadmill sessions and exhausting weight lifting, but fortunately there are loads of other exercise options and machine that can offer results without unnecessary suffering. Vibration plates sound almost too good to be true. 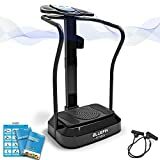 How is it possible that someone could stand on a machine and lose weight/gain muscle without having to do a complicated routine or even move themselves at all? The answer is actually pretty simple. When you are standing on the machine and it starts to vibrate, your body has to try to keep its balance to stop you falling off the machine. Your body will maintain its balance through the vibrations by contracting and releasing your muscles, and since the machine will be vibrating quickly your muscles have to work quickly to keep your balance. So it does use your muscles and it does require your body to do some work, but all you have to do is stop yourself falling off the machine! Exercise is most effective when it is varied, and you are more likely to lose weight if your workout is varied in speed, duration and resistance. Vibrating plates move in multiple directions and it is normally quite easy to control the speed of your vibration workout via your machines display system, so vibrating plates can give you a very varied and versatile workout. Workouts that are varied are more effective than stagnant, repetitive exercise regimes and so you actually have a better chance of losing weight with vibration plates then you would if you went for a steady jog every day! Vibrating plates also let you vary your workout in other ways. You can choose to strengthen and tone different parts of your body by adoption various positions, you can choose the kind of workout you want to do (i.e weight loss, strengthening etc) and it can even give you a massage! 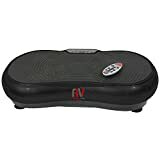 Keep in mind that in order to get the most out of your vibration plate you can’t just stand on it. There are tons of positions and exercises you can on the machine including squats, lying down, stretches and isolations. Some vibrating machines come with a training DVD that you can follow and there is tons of information available online, so take a look around and see what exercises will help you get the most out of your workout. Whilst vibrating plates can and do work, you can’t expect to eat cake all day and still lose ten stone just from using your vibrating plates. Weight-loss requires a mixture of exercise, a healthy lifestyle and a healthy diet and sadly there is no quick fix or loophole. Exercise is, however, a big part of weight loss and it is a crucial component for both losing weight and maintaining a healthy weight. There are loads of ways to incorporate more exercise into your life, but some people can’t or just don’t want to join a gym, go for early morning runs or spend all their free time in fitness classes. Purchasing your own gym equipment allows you to use it whenever you want in the privacy of your own house, and it can take the pressure off by allowing you to multi task by watching TV or listening to your own music whilst you workout. Treadmills, cross trainers and rowing machines are effective cardio machines but they can be quite hard to use and beginners may find them quite daunting. The great thing about vibrating plates is that they do work your muscles and they can help you lose weight but they won’t make you out of breath, they won’t make you suffer unnecessarily and as they don’t feel as ‘hard’ you can actually keep using them for longer and thus achieve better results. If you’ve decided to invest in your very own vibrating plates there are a few things you’ll need to think about before you invest. Gym equipment tends to be an expensive and bulky long term investment and we want to help you get the most out of your money, so read on for our buyers guide to vibrating plates. 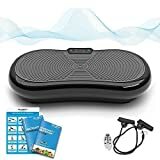 There are tons of different vibration plate machines available on the market, and when you are searching Google or going through Amazon listings you will come across the terms ‘oscillation’ and ‘vibration’. But what do these terms mean? Oscillation plates are specifically designed for weight loss, losing cellulite and decreasing your body fat. Oscillation basically refers to a see-saw movement that can be adjusted as you improve. This type of work out will focus on your lower half I.e your core and legs. 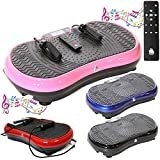 These types of vibration plates are great for strengthening and toning because they are multi-directional. This means that as well as going side to side they also move up and down and forward and back, so they work your muscles in a variety of ways and are a little harder to use than machines that just use oscillation. If you have ever been to a gym and seen a vibrating plates machine, it was probably a Tri-Plane machine. Whenever you buy an expensive machine, it is important that you look out for the warranty. This is especially true of personal gym equipment because it tends to be quite bulky in size and expensive in price, and so you’ll want to make sure you are getting the most out of your investment. If your vibration plate machine has a warranty you will be protected from accidental damages and/or manufacturing errors during the length of that warranty, so if you receive a faulty machine you can get it replaced for free within that time period. Warranties are also a good indication of the quality of your purchase. If a machine has a 10 year warranty, that means that the manufacturer is fairly confident that machine will last at least ten years. There would be no point in slapping a massive warranty on a product that the manufacturer knew would break within the first six months because they would have to keep paying out, so it makes sense that a company would only put a warranty on a product they were sure about. Therefore checking the length of a products warranty is a good way of checking how durable that product is. Warranties are very important, but what if you buy the machine and realise that it’s not for you? Money back grantees protect you because if you do decide you want to return your machine you will be able to get your money back within a reasonable period of time (most guarantees run for a month). It’s very important to check that the product you are buying does offer a returns guarantee and that it is within a reasonable time, because some companies will either not offer a guarantee at all or will offer it within a very short space of time (sometimes less than 7 days!). Also check if it is you or the company who will have to pay for the postage and packaging, as large machines like this may cost quite a lot to return. Some companies will go above and beyond to help you out, and many U.K based vibrating plate manufacturers will actually deliver and install the machine in your house for no extra cost! This is a pretty important perk because it may be quite complicated to have to try and put the vibrating plate machine together yourself. If anything were to go wrong with your machine it’s important that you would be able to contact the company and talk to them, so always make sure there are contact details and the machine comes from a reputable company. Also try to check customer reviews on sites like Amazon as you’ll be able to see if there’s been any positive or negative feedback for the particular company. Some companies will even come and fix the machine themselves if it breaks within a certain period of time (usually the time covered by your warranty) so it’s a good idea to check and see if that applies to you as it is a lot easier and less costly than having to do it yourself. It may seem really obvious, but there is no point buying a massive vibrating machine only to find you can’t fit it anywhere in your studio apartment and so before making a big purchase like this you should always make sure that you have enough space when it arrives. Most products will have their dimensions (hight, width and depth) listed in their specifications, so it’s a good idea to make a note of these and then measure the area to make sure it’s compatible with the machine. The size of your vibrating plates motor is important for several reasons. A larger motor will be able to handle heavier weights and so will be able to accommodate heavier people, and larger motors tend to be quieter than smaller motors because they don’t have to push themselves as hard to be powerful. If you live in a small flat or you have several room mates the sound of your machine is a pretty important factor to consider. The frequency range refers to how fast the plates in a Tri-plane machine can vibrate per second. These ranges tend to be measured in hz, so for example if your machine vibrates at 70 hz that means the plate will vibrate 70 times in one second. It’s important to have a large frequency range because the higher the frequency is the harder the workout will become as your muscles will be working harder, and if you want to keep using your machine and improving for a long period of time you need to allow yourself room for improvement. When you first buy a vibrating plate machine you will be working on a low setting, but as you improve you’ll need to increase the intensity if you want to keep seeing results. There is no point in investing loads of money in a machine that has a limited range because once you master it you’ll be able to maintain your weight, but you’ll find it harder to lose weight or gain more muscle. Oscillation plates are measured in speed rather than hz, and most of them will have around 80-120 speed settings which you will be able to control manually via the machines display panel. Most vibrating plates will come with a display panel which will show you your speed and time. Most display panels will also let you control your work out; some will have in-built workout programs that you can follow, and most will let you adjust the speed and save your progress so you will find it easier to improve. It is important to make sure that the machine you are buying does have a display panel because if it doesn’t not only will you miss out on a lot of features but it may be very difficult to control the machine during your workout. 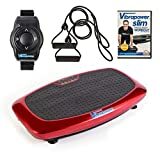 Vibrating plates come in different sizes, and you’ll tend to find that bigger plates are more comfortable and can accommodate more positions and therefore allows you to try new things and adjust your workout. This brings us to the end of our buyers guide to vibration plates. We hope you have found this guide informative and helpful and you now feel confident to get out there and make the right choice for you.